For a spotlight with a difference, take a look at our Chamonix Spotlight crafted from galvanised steel. 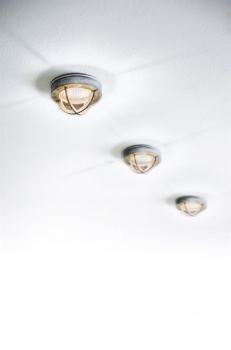 Designed to be recessed into the ceiling, this is a great way to add the perfect amount of down lighting in any room. It makes quite the style statement with its industrial chic too. Please note, this light does not include a bulb. We recommend 35/50 W Halogen GU10 bulb (dependent on surface) or an energy saving equivalent. Try our new 5.8W LED GU10 energy saving bulb.